Pen and marker. This one is hanging on my wall. 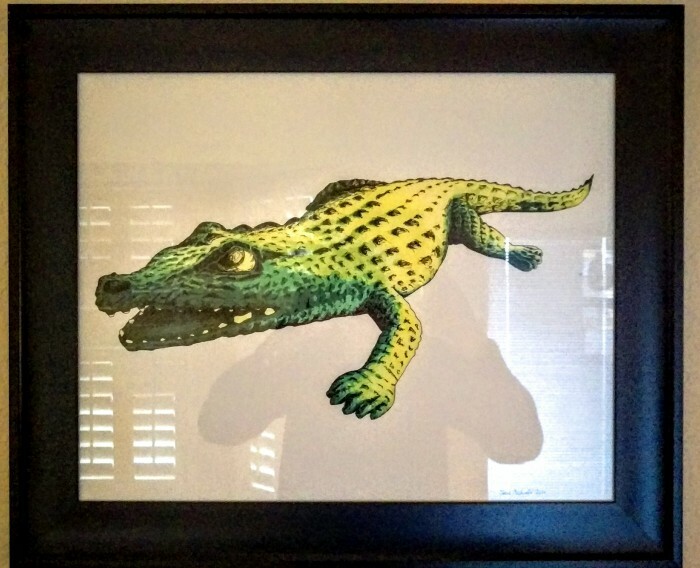 It is a drawing of a rubber alligator I found on the side of the road while cycling a couple of years ago. When I got it home and cleaned it up, I was amazed at the level of detail in the mold it was made from. I wanted to bring the detail out by drawing it and was happy with how it turned out. Inspired by Steven Pressfield's The War of Art. I just started reading the War of Art by Steven Pressfield. 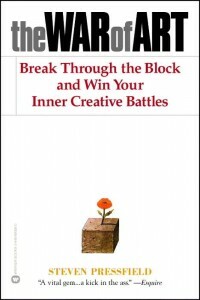 The premise of the book is that if you have an unfulfilled passion for something, if you want to live a creative life, succeed in a business, capture some giant goal, but always seem to fall short or, worse yet, fail to ever start, you are not having a problem achieving the thing, you are having a problem overcoming the resistance you have to realizing your dream. Based on the cover copy, the forward, and the opening chapter, this is a powerful book. I've struggled with the discipline of writing lately. I have the novella I'm in the middle of and I haven't worked on it for a couple of months. Months! I've been creative - some art projects and poetry, but if I am ever to realize my creative potential as a novelist, working on other things than my current novel is a little bit of a waste of precious time. It's not that I'm blocked. I fell into a couple of weeks of copywriting assignment and even though I always had a reason why I couldn't find the time to work on my novella, I knocked out 500 polished words a day on the virtues of a cycling company's products every evening. Sure, they were paid assignments but no one pays a novelist to work every day (do they?). You only get rewarded after you've done the work. And even then, there's no guarantee how rewarding that pay-off will be. So realistically, I need to work on my fiction as if it were a copywriting assignment; professionally, every day, with some sense that it must be done as if there were a reader just waiting every day for the book I'm working on to arrive. And then I don't. And then I feel guilty. And then I come up with reasons why I didn't or couldn't get to what I know I need to get to if I'm ever going to have a chance. The book addresses the state I find myself in. It is uncomfortably direct. It hits as if it were someone you admire, who is professional, who is accomplished in the field you want to be part of, and who came to your office and called you an amateur who doesn't know how to work and will never make it. It's scary direct. It's the kind of kick-in-the-pants I've been looking for. This will be a multi-part review. I want to absorb the book's message. I want to process it as it comes, as Pressfield intended. I want to make sure I get as much out of the book as possible. I don't want to rush past something because I assume I understand it. So as I work the book and see how it impacts my creative life, I will write about my experience. That starts with the impact of the opening chapters. A couple of nights ago I read the chapter on the way resistance manifests itself to keep you from doing the work you need to do to reach your goals. Pressfield wants you to closely examine the thing that's keeping you from your potential as an artist and the ways it manifests itself. I resonated strongest with three of his examples. I know that he is leading us somewhere, presumably to his system or psychology for overcoming resistance and getting to the work or being a professional creative but i'm not going to get ahead of myself. I am examining the way I resist working on my story. Procrastination: Oh boy, am I a master and telling myself that I will get to it. I am a master at making plans, to write starting tomorrow. Or that I just need to (fill in anything from run this errand to finish this show/series) before I start. Or that I need to work more on the outline. I can always come up with something that comes before the writing can start. If I were being true to what I really want to accomplish with my life, I would put writing first every day. I would wake up, write until I feel satisfied with my progress, then begin the rest of my day. Comparison to others: I read a lot too. It's one thing to look up to idols and admire the work of others. It's another to look at the work of others and say to yourself that you don't measure up. I need to get comfortable with the idea that only by working and improving will my writing reach the point where it can stand on its own in the world. I need to accept that my work will be it's own thing and it does me no good to measure against an idol, say, Stephen King. I need to allow myself to accept that there are tens of thousands of novels written and my work, my voice, my ideas expressed as fiction, have just as much a right to exist in the world as any other. Consumerism: Too many times to count I've reached the end of a day where I worked my day job, spent time with family, cycled with friends, taken in some kind of entertainment, only to bemoan the fact that I couldn't find the time to write. I'd then evaluate the day and realize I gave several hours of my life to the creative works of other people; television shows, movies, news radio. By definition, this makes me a consumer and not a creator. I need to turn that equation around because if I spend my whole life in consumption mode and never reach this goal of mine to exist as a novelist, I will be pissed. Many more of Pressfield's examples of resistance resonated with me. 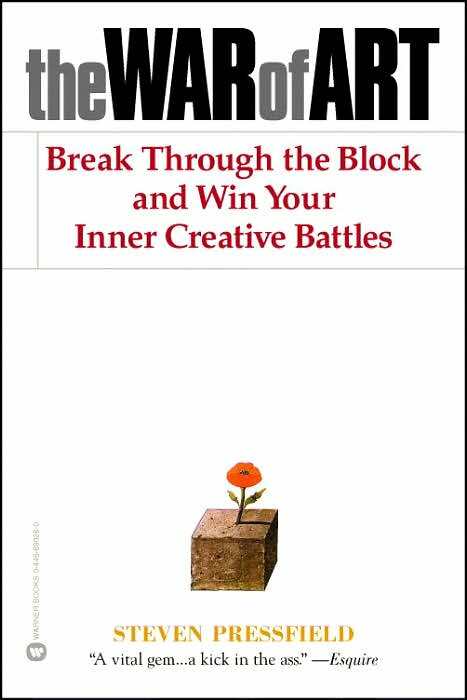 I only hope that his intend is to use this section of the book like the military uses boot camp; to tear the recruit down so he can be built back up as a warrior ready to face the war ahead (the war to overcome resistance and reach your potential as an artist). My wife and I are both creative. We always have a project or two going. We have art supplies around the house. We both have artwork we've made hanging in the house. The creative leaning has manifested in our children (and now grandchildren). One of my sons creates electronic music under the name Nekophiliac. He's been producing collections of songs since he was in high school. I love most of his music. 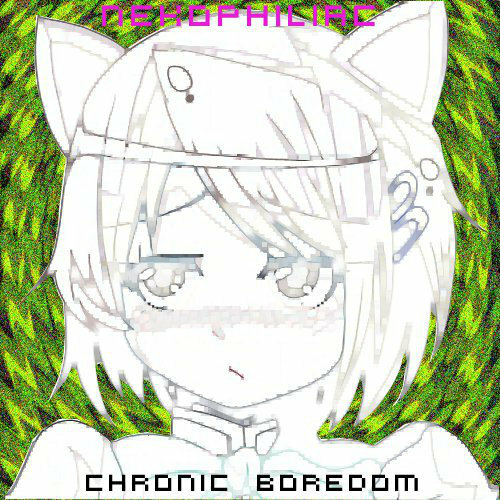 Some of it is too fast or too genre-specific to a very particular kind of taste (lolicore he calls it) that I can't follow it but most of the music he makes is thoughtful, melancholy, and beautiful. Perfect music to write (or just chill) too. He creates his music digitally, on a laptop, in a software program of which I can't remember the name. He creates his own album artwork. He publishes his albums on a platform called Bandcamp. He collaborates with other electronic artists who produce music along the same lines as his. He creates prolifically. Since he started posting under this identity (he's published under at least one other name/style), he's put out twenty-seven albums and EP's. This amount of work has let him develop real proficiency with his tools and his finished work product is fully realized. I look forward to his posting new work. I download it and give it a listen as soon as it posts. I have favorite tracks and love to share his music with people if I can weave it into a conversation. My absolute favorite track is called [btf]. Listen to it here. He struggles with promoting himself and his music. We were driving together today and the topic of conversation turned to the things that we both do to hold ourselves back as creators. I just started reading the War of Art by Steven Pressfield. The premise of the book is that if you have an unfulfilled passion for something, if you want to live a creative life, succeed in a business, capture some giant goal, but always seem to fall short or, worse yet, fail to ever start, you are not having a problem achieving the thing, you are having a problem overcoming the resistance you have to realizing your dream. I plan on writing more about the book in this blog but let's just say last night I read the chapter on the way resistance manifests itself to keep you from doing the work it would take to reach your goal and it motivated me to get busy writing. The things I spoke to with my son about were the definitions of resistance from Pressfield's book that I resonate with strongest on first pass. My son and I immediately found common ground. First, my son and I agreed we both compare ourselves critically to other artists to our detriment. I read a finished, published novel and compare my own work to it and think that I don't yet measure up, that my work is immature and unrealized. I've written five novels. I'm not ready to call any of them complete and ready to publish. He told me he does the same thing with his music. I told him that I don't show my work to anyone other than my wife for fear that I am going to get negative feedback. He told me does the same thing. We both post publicly, but only in a safe, controlled space (Bandcamp for him and this blog for me). And I think all creatives know that besides the work, the second-most-important aspect of succeeding in the arts is promotion. I was so grateful for this conversation, to discover this common ground, because now we can both work to help each other, to be accountable to each other, to take our creative life to the next level. I want to be a positive influence on my son's creative life. I want to show him the way through his resistance to success. The best way for me to do that is to tackle my own resistance and be an example. I went for a ride this morning on a singlespeed road bike and I guess I haven't paid enough attention to the maintenance of this bike because the chain squeaked and grinded the whole ride. It reminded me of an article I wrote over ten years ago called The Art and Philosophy of Bicycle Lubricant for a now-defunct website called Bike.com (this is not the same site as t was ten years ago). I found the article in my archives and thought I'd share the advice I forgot to take. When I told my wife I needed to test a bunch of different lubrications, her eyes grew wide. But I saved from her the horror of her imagination and told her what I meant was that I was working on a review of bicycle chain lubes for Bike.com. The job turned out to be tougher job than I anticipated. The problem was that I wasn’t sure how to go about it. Lubricating your bike’s moving parts is as essential to riding as the correct air pressure in your tires but how do you review lube? Applying a bunch of different products and riding with them didn’t seem to yield more than an anecdotal feel for how one might be different from another. I mean, they all stopped my chain from squeaking. I needed to come up with another was to measure one lube against another. Something that could tell you which one to buy. But what else could I do? Rub it between my fingers? Taste it? Research the chemical composition of each and run it by some engineer friends of mine to write up the characteristics of each that make it superior? The problem with a more scientific approach is that I’m neither engineer nor chemist. Besides, how relative would that be to a general audience anyway. You guys are cyclists, not rocket scientists. I wanted an approach that was relative to you. I did two things. First, I went to the Slippery Pig Bike Shop in downtown Phoenix to talk to Erik Angermeier, the shop’s owner and the single greatest behind-the-counter cycling mind I know. “Show me the lubes you carry,” I asked figuring he would carry one, the one he was sure was the lube to end all lubes and I’d get an instant shortcut. Unfortunately, he carries a shelf load. Several different kinds. And had no relevant preference. In other words, he was no real help. So I decided to go to the source for you. Call the manufacturers themselves. Ask them to tell me the truth behind bicycle lube. I talked to Brent at Phil about their Tenacious Oil, Karl at Pedro's and Andy at DuMonde Tech among others. One told me that theirs was the standard, the traditional, superior, clean and simple bicycle lube used in better shops all over the country. And it was. Another explained their use of a wax base and the benefit of how it helped their lube stay applied to the chain and threw off dirt through intense use. And it does. Another told me about how their synthetic lubricant polymerizes into a plastic coating somewhat similar to Teflon and, after it has been properly applied, only needs to be reapplied when the sound of the chain changes. And it does. What I didn’t hear form anyone was “Use our lube and you’ll get 11,000 additional miles from your drivetrain vs. using the other stuff.” They claimed only a more intelligent approach or a superior chemistry. No one made the stand that their product, in and of itself, was by far superior to any other bike-shop stocked bicycle specific lubricant. And the realization that came to me after all this talking, questioning, and sampling lubricant was that the thing to know about proper protection of your bicycles moving parts is not so much which product on the market to use, but how to master the art of lubrication itself. To that end, and gleaned from the collective knowledge of the Slippery Pig Bike Shop and several extremely passionate and educated lubricant industry specialists (I wonder what it feels like to tell the family that’s what you chose for a living), I submit these lessons. These are the keys to getting maximum performance from your drivetrain while preventing the premature wear and tear of every link and cog along the way. And we all know what happens when the metal stuff wears out right? We’re dropping half a rent check at the bike for chainrings, chain, cassette, and derailleur pulley wheels. Don’t mix lubes: The various lubrications available at your local bike shop are not all based on the same substances. Some are petroleum-based, true oils. Others are based on Wax. Others on synthetic material. Many different manufacturers use unique mixtures of additives for this and that reason. When mixed, some combinations of product work completely against each other. DuMonde Tech’s lube, for example, contains a synthetic polymer, a coating that bonds to your chain only when it has been properly applied. Put DuMonde Tech on a chain that already has an oil coating and it will never penetrate to the metal or polymerize (their term) correctly. Apply oil over White Lightning’s wax-based lube and you’ll get nothing more than oil being thrown from your chain, unable to work its way past the wax. So pick a product and stick with it. Let it do the job it was chosen for by the manufacturer and don’t work against it by mixing it with something else. Clean the chain thoroughly: This rule applies even for a brand-new chain. Lube, no matter which form, is a clingy substance. It needs to be. 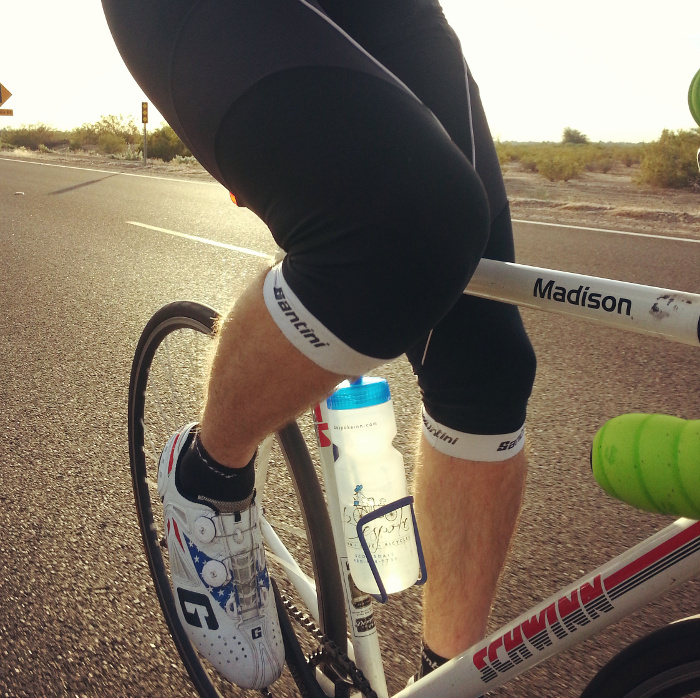 It has to stay on your bike’s chain in order to continue to provide the friction relief that will ease long-term wear. Because it’s so sticky though, lube is also a great collector of dirt. Dirt which traps moisture close to the precious metal you’re trying to protect. So before lubing the first time, and before any subsequent reapplication, wash the dirt off your chain with soap and water. Or clean with a degreaser the solvent the manufacturer of your lube recommends. This way there will be nothing preventing your lube from getting to where it needs to be. Apply by the rules: You buy lube to protect your drivetrain. There’s a reason why there are sets of instructions on every lube bottle. I know you might say that the lawyers make them do it, but if you’re ever dissatisfied with the performance of your lube, I would tell you to first read the bottle and see if you’re the reason why it’s failing. There is a precise science to lubrication. It protects only when it is applied a certain way. That certain way is not the same for every product. In fact, follow the rules for one when applying another and you just may be doing the one thing that guarantees your lube will not perform for you. If you’re not applying lube exactly and specifically as the label says, you can’t expect it to perform the way it should. Wipe off the excess: Okay, you have a clean chain. Apply an even flow of lube on the links of chain, spinning the crank backwards, until the chain is evenly coated. Wait a moment to think about what you have just done and let the lube settle into the chain. Then, rag cupped in palm, gently roll the chain through your hand, wiping away the excess. The metal needs a fine coat of lubrication, not a bath. Any more than what is needed becomes a magnet and glue for corrosive dirt, dust, and moisture. Reapply only by the rules: Many people do not lube their chain enough, waiting until the poor drivetrain is squeaking like a mouse with his hindquarter caught in a trap before putting it out of it’s mercy with a few ounces of precious oil. There is a temptation, and maybe even habit for many seasoned cyclists, to lube up before every ride. It might be something you do just as often as checking the pressure on your tires. Resist this temptation or cure this habit. Each brand has, written most likely in plain language on the label, a guide for when you reapply lube. For some brands it may be frequently, every few rides, weekly even. For others, like DuMonde Tech, the rule is to only add lube when the smooth sound of the chain begins to fade and the pinging of links can once again be heard. Whatever their rules, follow them closely. When reapplying, wash with soap and water first. Dry everything next. Strip the chain with a solvent or cleaner only if the chain has become overwhelmingly grimy or the lube’s instructions tell you to. Keep your shifting adjusted: Nobody’s perfect. Gear’s slip. Cables stretch. It’s almost impossible to never have a shifting problem on an engineered system as precise as modern bicycle gearing. But know that when you’re getting a clacking noise from the cassette while ‘in’ a gear, you’re accelerating the pace of wear on your drivetrain components. Proper lube and care will only take you so far. All your hard work and attention to the Rules of Lube can be tossed to the side by a few weeks of riding on improperly tuned gears. Take a moment to make the adjustment as soon as gears get out of whack. If you don’t know how, learn. Or better yet, take a ride to your nearest and friendliest bike shop. Replace all worn parts together: When you either ride your chainrings to nubs, stretch your chain beyond the tolerances allowed by its design, or neglect the simple and reasonable Rules of Lube, replace all the parts in your drivetrain together. A new chainring or cassette will be prematurely worn by a stretched chain. A new chain can just as easily be ruined by worn cogs. Replace them as a set, no matter how much it hurts financially. Long term, it’s the only investment, besides the $10 bottle of lube and cleaner of course, that makes sense for dealing with the problem of a worn drivetrain. That’s it. Seven simple rules. Follow them and your expensive drivetrain components will outlast your legs. All that’s left is for you to pick the lube that’s right for you. You want one that’s compatible with your climate, simple enough to understand and apply, and carried or recommended by your friends or your bike shop.